SATURDAY 10 SEPTEMBER, HISENSE ARENA, MELBOURNE – 2 SHOWS ONLY! Rehearsals are well underway for the Victorian State Schools Spectacular as 3000 students get ready for this year’s show, entitled ‘The Elements’. Students from more than 200 government schools are preparing for the September 10th extravaganza at Hisense Arena which will feature everything from show stopping vocals, high energy dance to awe-inspiring magic tricks and skating … not to mention a giant robot cat puppet all brilliantly choreographed for this three hour show. The show will be a concoction of the ancient elements of Earth, Air, Fire, Water, combined with the Periodic Table of Elements – all served with a dash of pop music and stage magic. Vocalist Maddie Andreopoulus has been awarded a scholarship to the New York Film Academy and has secured roles in TV commercials. Vocalist Imogen Spendlove is already a seasoned performer having appeared on Young Talent Time, The Voice Kids and Knox Carols By Candlelight. This year she also performed at the Melbourne Cabaret Festival her original one woman show ‘Lost in Love’. Award winning magician Tim Mason who has performed in Las Vegas, representing Australia at the International Youth Magic Championships. And not to forget the 64 piece orchestra, 1300 voice choir, 1200 mass dancers, 30 lead vocalists, 14 principal dancers, 16 ensemble dancers, 8 backing vocalists, 22 roller skaters and ten puppeteers. In the lead up to September 10, the students have the opportunity to learn and work with industry professionals such as Musical Director Chong Lim, Creative Director Neill Gladwin, lighting designer Paul Jackson, Puppetry team Felipe Reynolds and Ed Boyle, and choreographers Yvette Lee and Deon Nuku. The Spectacular also has a partnership with the Australian Chamber Orchestra as well Jason Coleman’s Ministry of Dance. 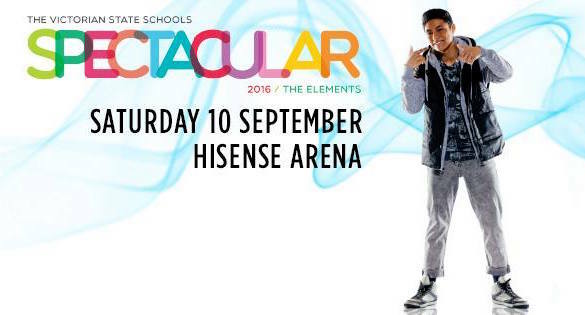 The 2016 Victorian State Schools Spectacular will be held before an audience of more than 10,000 people at Melbourne’s Hisense Arena on Saturday 10 September, with one show at 1pm and another at 6.30pm. The show will also be broadcast on Channel 7 at a later, to-be confirmed date. The Spectacular contributes to a number of the Government Education State targets, including more students reaching the highest level of achievement in the arts, ensuring our kids are happy, healthy and resilient, and increasing pride and confidence in our schools. Presented by the State Government of Victoria, the 2016 Victorian State Schools Spectacular – The Elements, is a not-to-be-missed event. DanceLife has 2x double passes to give away to see the Victorian State Schools Spectacular 1pm show on 10th September. To enter send in your name, number and mailing address to win@dancelife.com.au with the subject header of VSSS16. Entries Close 2nd September.